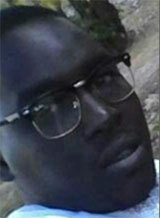 Nassau, Bahamas - Police are seeking the public’s help in locating wanted suspect 28-year-old Alfred George, of Knowles Drive off Tonique Williams-Darling Highway. He is wanted for questioning reference to Murder. George, who is considered to be armed and dangerous, is of dark brown complexion, medium build and is about 5’ 7” to 5’ 11” tall. George is being asked to turn himself in to the police immediately. ONE OF THE MOST USEFUL TOOLS FOR CRIME PREVENTION IS TO CALL YOUR LOCAL POLICE. YOU MAY THINK THAT THE POLICE DO NOT WANT TO BE CALLED IF SOMETHING SUSPICIOUS IS HAPPENING, BUT THAT IS NOT THE CASE. WHEN IN DOUBT, CALL THE POLICE.